What is this you ask? It is a creation by one of my heroes. My internet hero. Alex Tew a 21 year old kid in Wiltshire, England who was afraid that college was gonna put him in the poorhouse so he came up with the idea for the Million Dollar Homepage. One million pixels for sale at a dollar each. Sell them all and you have a million dollars. Of course you can't buy one pixel. You have to buy a batch of 100 which is still a pretty small square. You then fill that square however you like and link it to your website. Well folks, look at the counter, so far he has sold half of them. $504,800 while I am typing this. College was long ago paid for and if he plays his cards right unnecessary. Click the banner and check out the page. I don't know why, but I find it fascinating. I truly try not to get political here at GreedoNeverFired, but sometimes it simply cannot be helped. Violence in video games and its affect on the youth of America is an issue that must be addressed. Oh… down 30 percent. 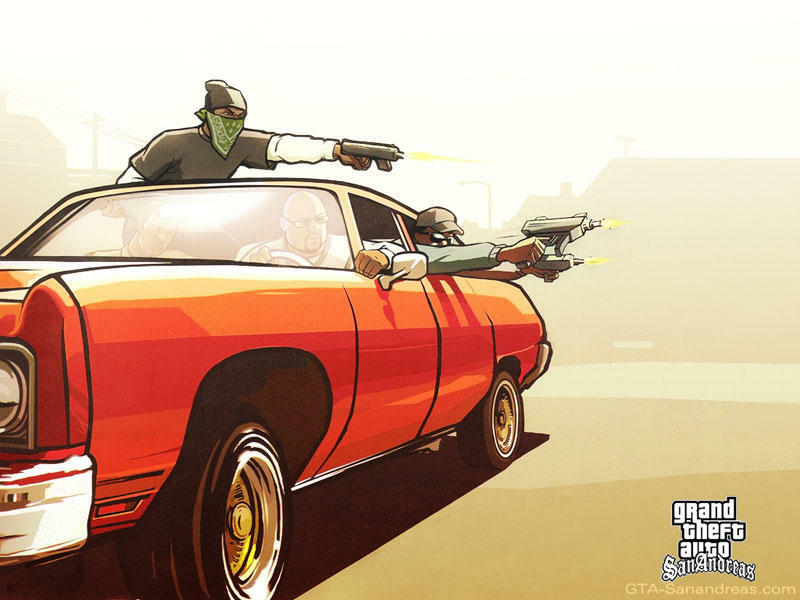 And the downward trend coincides with the rise of realism and violence in video games. Well, ok then... never mind. A few years back I was walking to my bartending gig when I spied a sweet cell phone... on the ground! So I pocketed it. When I got to work I broke it out and had a scroll through the numbers. The owner had failed to make the first number on the phone his home phone number (which I recommend) so I eventually settled on "Mom and Dad." Talked to his dad, who called his son and just like that the owner was on his way. I Had also noticed while scrolling that he had the digits of some celebrity heavy hitters in there. I of course jotted down 2 or 3 for emergency purposes. Well, he showed up with friends, asked for his phone, asked suspiciously more than once where I had found it, opened a tab drank for an hour, stiffed me and left. He never even thanked me. So I called Jim Jarmush (one of his high brow phone numbers.) Put on my best "3 sheets to the wind" voice and left a message saying that (insert name on credit card from tab) was through with him and had no interest in working him in the future. Why am I telling you this? I think there should be a new cell phone feature called "Remote Locking" or "Secure Retrieval." It would work like this... You realize you've lost your phone. You may also realize whoever finds it can call their relatives in Pakistan for the rest of the night (right Ricky?) or they might find your dirty pics and put em on-line (right Paris?) So you borrow your friends phone and call yours and enter the "Security Retrieval" code. The phone disables all functions excluding the ability for the person who found it to leave a message on it's voice mail. A big 'ol message would notify the Good Sam of his one option and he would of course do the right thing. UPDATE: It occurs to me that you would also want the ability to be the only one who can call the phone once it is disabled. So when you call your own phone you get the message "please enter Security Retrieval code." Ok I think that covers it. I am gonna come at this tiny breakthrough like this. The PSP is a tough sell for the kids. That is to say I had a hard enough time convincing my dad to get me TCR (Total Control Racing) and that was cheap. I can't imagine a kid convincing his parents to spring for a $250 plus device. Unless... Unless it could also be a learning tool. A "study aid" if you will. Again, its obvious and easy, but I couldn't find it anywhere so here it is. I am not going to expand on it and complete the sets. They are just to show what can be done. I am actually just putting them up in hopes that the folks who already make these types of study tools will grab it and run with it and in turn make it easier for kids to beg for a PSP. In short I am doing it for the children. The folders needed are SIT files. I think you have to right click for peecee and option click for mac, or something like that, to do save as. As you may have already guessed Dave Himself (that's me,) my design company and GNF operate from my home. How else would I have the time to write pointless articles for a handful of strangers. It is a sweet deal I have to say. Nothing beats making a living in your tighty whiteys. A draw back that recently occurred to me is the fact that all of my important files live in the same place. Sure I back up my files (I actually do and you soooo don't.) But I back them up to an external drive one foot away from my computer. In the even of a catastrophe (flood, fire, accidental demolition of my building) I would of course lose my computer as well as my back-up. So I fire up the google and find www.streamload.com. This site will give you 10 gig of back-up for free. 10 gig wont cut it for me (big fat PhotoShop files) so i will be paying, but for most of you it will handle a ton of word docs, emails, excel docs and more. It's easy and its free and the alternative is to tell the your client or your boss or your professor or the IRS that "you're sorry but the files are gone." Take a peek. It's very user friendly and it is the future of data storage. Eventually only paranoid schizophrenic outlaws will have local drives. I've got four, 500 gig, Seagate Barracudas in zip-locks in my freezer. There's hardly any room for severed fingerprinting hands in there. I think we can all agree that perhaps the greatest use of the NYC subway system of all time was, is and shall always be it's use as a back drop for Walter Hill's timeless masterpiece The Warriors. I personally have never had the pleasure of using a NYC subway restroom, but I can assure that if I did I would emerge from my stall ready to fight. Okay, maybe we don't all agree, but many are with me on this I am sure. Since my most successful blog post by 11,000 hits was thanks to the NYC subway I have decided to stick to the theme. That and the fact my Ultimate Directors cut of the film arrived in the mail today. 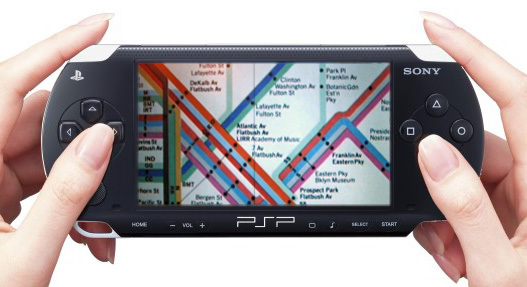 The image you see on the PSP above is the map featured in the opening scenes of The Warriors, and is discussed in one of the four well done featurettes. Amamzon has got the UMD Here. And the DVD Here. This guy Here has a strange sense of design, but an amazing collection of Warrior based goodies.